More than 24 years of sailing experience, has sailed on Merchant Ships from 1973 to 1997 on General Cargo Ships, Bulk Carriers, Multi Purpose Ships, Oil and Chemical Tankers, Reefer Ships, Log Carriers, Cellular Container Ships, Car Carriers with command experience of more than 11 years. His association with ARI started in 1998 and since then he has been teaching in various competency courses from Pre sea to Master FG, Modular and Simulation based courses. Extra Masters, 2003, Govt. of India, Mumbai. Master (F.G) Indian, 1992, Mumbai. Post Graduate Diploma in International Business Law , 2000 from Indian Institute of International Law. Presently pursuing his LLB from Delhi University. Director (Academics) is working with ARI since 1997 i.e over 17 years .He has done his Pre sea training from the T.S Rajendra 1982-83 batch. He is an approved External Examiner by Govt of India to conduct Orals examinations for Mates and Masters since 2005 .He is the Hony Chairman of the CMMI Delhi Chapter and member of various nautical associations such as Nautical Institute , Indian Met Dept , DRACEA , Chartered Institute of Transport UK etc . Capt. Mittal is 1980-81 T. S. Rajendra pass out and has a sailing experience of approx. 20 years. He has been with ARI since 2001 and has a vast experience in the field of training and education for the last 15 years. He has worked in various capacities in the organization such as Quality manager, COO of Pre Sea Campus, COO post sea campus. He had written a book on Cargo work for DNS course conducted by IGNOU. He is also Secretary of Nautical Institute (N&E) India Branch. At present he is looking after all the modular course and is liaising with companies for designing and development of various courses as per their needs. He has been taking classes in competency courses at all levels and modular courses. He is an approved external examiner for MMD and approved evaluator for IGNOU. B.Sc (I) from Hans Raj College, Delhi. Master (FG), Lead Auditor Course for Integrated Management System (QMS, EMS and OHSAS) from ABS. Basic qualifications: Passed 10th standard from C.B.S.E. in 1978 and 10+2 in 1980 in First Division. Completed B. Sc from Kurukshetra University in 1985 in First Division. Professional qualifications: Obtained Master (Foreign-Going) awarded by Director General of Shipping, Government of India in 1993. Passed all the written parts of Extra Master Examination conducted by Govt. of India. Completed and submitted dissertation on “Model Rules for Inland Vessels”. Sailed till 1997 on Indian and Foreign ships in various ranks including tenure as Master from October 1993 to June 1997. During his career at sea, served on General Cargo ships, Oil Tankers and Chemical Tankers. Joined ARI in July 1997 as Faculty. From April 1998 to September 2002 worked as Head of Department (Nautical). Joined Aquatech Institute of Maritime Studies, New Delhi as Head of Institute and was associated with the setting up and launching of the Institute. Rejoined ARI on 1st July 2004 and from 15th July 2005 took over as Chief of Operations (Pre-sea campus). Have taught Navigation, Naval Architecture to nautical students from Entry Level to Master (foreign-going). Responsible for complete planning and setting up of ARI’s new post sea training centre at Panchkula. Prior to joining ARI, Capt. 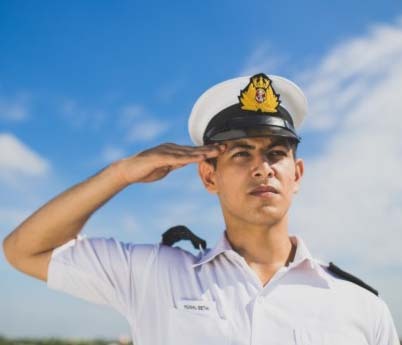 Kant had over 21 years of service in the Indian Navy where he gained experience as an instructor in Navigation and Ship Handling. He also has experience in the offshore industry. Capt. Nalin Kant has been associated with ARI both at the competency course level and currently as the head of professional development courses with specialization in simulation programs. Capt Kant has worked as an external consultant with the IMO to conduct programs on “Train the Simulator Trainer” at international locations. He is an expert in Navigation and Ship Handling. Work Experience: A Master Mariner, also holds a M.Sc. degree in Maritime Administration with specialization in Marine Environment Protection from World Maritime University (WMU); Sweden. He was the first student, in WMU history, to work as Research Consultant for two environmental consultancy projects in Persian Gulf undertaken by WMU, which included marine environmental damage assessment as result of oil pollution, as well as development of regional contingency plan for oil pollution involving eight countries of Persian Gulf. He has been a Commonwealth Consultant as Marine Affairs Advisor to the Government of Jamaica where he led a team for the development of Jamaica’s national policy on ocean and coastal zone management that was passed by the Parliament of Jamaica. Capt. Saujanya Sinha has regularly undertaken environmental consultancy projects over the years spanning a wide spectrum. One of the prominent projects of note is the Swedish International Development Agency (SIDA) funded project on the expansion of Colombo Port in Sri Lanka where his expertise was utilised to look into the Integrated Coastal Zone Management (ICZM) within the legality of environmental law of Sri Lanka. His key specialisations include Ocean and Coastal Zone Policy at national level, Integrated Coastal Zone Management, Marine Environmental Contingency Planning, Marine Environment Damage Assessment, Maritime Training and Education. Capt. Sinha has published 12 papers in journals in India and abroad on topics ranging from maritime safety and marine environment protection to India’s foreign policy issues with regard to the maritime domain. He has also presented papers at various conferences in India and abroad. He has been with ARI since 2006 and is presently Associate Director, Academics and Knowledge Management System and is actively involved in teaching law and international Conventions. He is a Member of the Nautical Institute and has been the first recipient of Sailor today award for “Exemplary Personal Achievement” by Indian seafarer in 2002. Capt. Rajeev Avasthy is currently the Captain Superintendent of Capt. S.S.S. Rewari School of Maritime Studies. He is a Graduate with more than 20 years of experience on different types of ships such as TANKERS, BULK CARIERS, REEFERS, OBO’S. His association with ARI started in 2003 and he has more than 11 years of teaching experience. Making course syllabi, teaching material and training PowerPoint presentations for EMTI. M.Phil. in Psychology from Delhi University. B.A. (Hons.) L.S.R. College, Delhi University. Jyotsna Tewari has over 14 years of experience at ARI. In her current role she manages and supervises the Human Resource Team on a day to day basis. She has an expertise in Training and Development and conducts In house training programs and provides psychometric assessment and counseling services in-house as well as to clients globally. As a Marine Psychologist, she is involved in simulation observations wherein she has been able to meaningfully apply her experience on-board towards understanding personality dynamics of seafarers. She has been conducting HRD programs for experienced professionals in the industry wherein with the aid of personality questionnaires she helps Officers recognize their areas of strengths and weaknesses. Thus the personnel’s are helped to bring about desired changes and set realistic personal and professional goals. Having done M. Sc. Physics with Electronics specialization, she is a trained Physics teacher with an experience of over 12 yrs in teaching. Joined ARI in September 2002. In the initial years, taught “Nautical Physics” to 2nd Mate candidates. Currently teaching Applied Science to cadets pursuing Diploma in Nautical Science leading to B.Sc. (Nautical Science). Besides Physics classes she is also responsible for various student welfare programmes being run at ARI presea campus.